Contrary to what many may believe, the development of self-driving cars started a long time ago, back in the 1920s already. Back then, a Chandler was radio controlled and driving in the streets of New York. Small electric motors were able to move the car in every direction. In the period 1940-1960 several manufacturers in the US and Europe were testing on a very small scale remotely controlled cars. Famous is the General Motors Firebird, a car having an ‘electronic guidance system’ so it could drive independently over the highway. In more recent times, the United States Congress passed the ISTEA Transportation Authorization bill in 1991. This bill instructed the US Department of Transportation to “demonstrate an automated vehicle and highway system by 1997.” The Federal Highway Administration took on this task, and theyestablished the National Automated Highway System Consortium (NAHSC), a consortium of companies and universities that developed around 20 different vehicles that were showcased on the I-15 near San Diego. Next to military applications, autonomous vehicles have traditionally also been used in mining. In December 2008, Rio Tinto Alcan began testing the Komatsu Autonomous Haulage System in Western Australia. Rio Tinto has reported benefits in health, safety, and productivity. In November 2011, Rio Tinto signed a deal to greatly expand its fleet of driverless trucks. 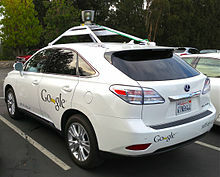 Google began developing its self-driving cars in 2009, but did not announce it publicly until a later time. Nowadays, many automotive manufacturers, including General Motors, Ford, Mercedes Benz, Volkswagen, Audi, Nissan, Toyota, BMW, and Volvo, are testing self-driving car systems. BMW has been testing driverless systems since around 2005 and in 2011, GM created an autonomous electric urban vehicle. During 2012, Volkswagen began testing a “Temporary Auto Pilot” (TAP) system that allows a car to drive itself at speeds of up to 80 miles per hour and Ford has conducted extensive research into driverless systems and vehicular communication systems.